Park Farm Holiday Park Tenby| Deers Leap Holiday Park | Cramcrest Ltd.
Park Farm Holiday Park has existed as a holiday venue in the heart of the Pembrokeshire National Park in West Wales for over 50 years. Park Farm Holiday Park is popular with all types of holiday-makers and campers from walkers exploring the longest coastal path in the United Kingdom to holiday home owners wishing to get away from it all after a busy week in office. The Park is said to be the closest to the popular Manorbier Beach and is a safe environment for family bathers and surfers alike. There are many attractions nearby for everyone to enjoy including the Oakwood Theme Park and Folly Farm visitor attraction and there are many famous eateries within a short distance of the Park. Park Farm Holiday Park is situated mid-way between Tenby to the East and Pembroke Dock to the West. 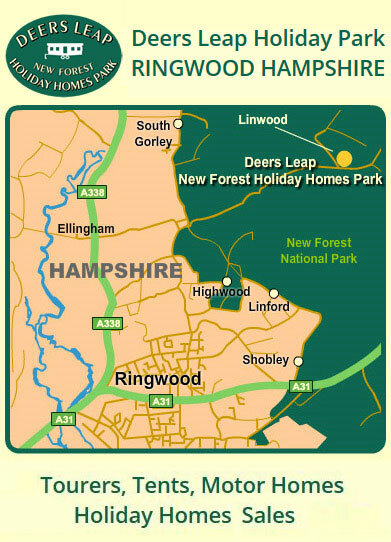 Deers Leap - New Forest Holiday Homes Park is situated near the market town of Ringwood in Hampshire and is the only holiday park within the confines of the New Forest National Park. Deers Leap is fortunate to be within a stone’s throw of the famous Red Shoot Inn in Linwood. Deers Leap and has just thirty-five holiday home pitches which are all owner-occupied. Deers Leap is ideally situated being just 15 miles from Bournemouth, Southampton and the sailing town of Lymington. Local attractions include Moors Valley Country Park and Paultons Park.